It looked like Silicon Valley. Open floor plan, bright orange tables, row upon row of young men and women in jeans with eyes glued to their computer screens. But we were miles away from Northern California, on the Asia side of Istanbul and instead of a startup’s headquarters we were standing on the second floor of a bank branch. This was TEB Start-Up House, a recent innovation by Turkish Economy Bank (TEB) and one of the many non-financial services that has made TEB so successful in serving the small- and medium-enterprise (SME) segment. 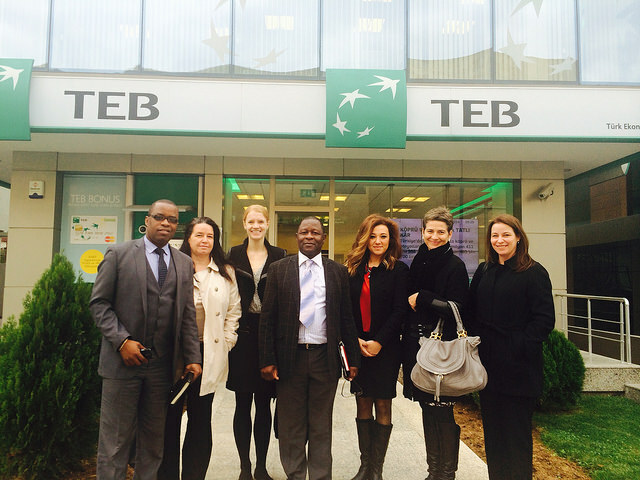 Women’s World Banking brought senior leaders from NBS Bank, a leading commercial bank in Malawi, to TEB in Istanbul to learn from its innovative model. Women’s World Banking has partnered with NBS Bank to expand financial access to un- and underbanked women. According to senior leaders from NBS Bank, the “SME segment is the biggest opportunity in Malawi” and they are investing in products and services to serve this segment. This visit is part of broader project funded by Financial Sector Deepening Africa to bring loans to entrepreneurs running small- and medium-sized businesses in Malawi. The visit allowed NBS staff to learn from the successes and challenges TEB has faced. This included the bank’s vision for SME services and how those were integrated into the business strategy and portfolio, as well as operational aspects such as client segmentation, performance management and staff training. While in Turkey, the NBS and Women’s World Banking teams spent 1 ½ days visiting TEB SME Banking Group. TEB aims to be the bank of choice for SMEs by acting as the “consultant bank” rather than applying classical banking approaches. “The bank customer relationship is no longer purely commercial” said a representative from TEB Bank. Being the consultant bank has three main components: technology; knowledge and research and development. In these three areas TEB works to deliver services in a low cost manner that benefit both the bank and the entrepreneur. TEB SME TV. This internet TV channel has more than 6,000 videos of solutions for their clients’ business problems. Clients can watch everything from SME experts to instructional, “how to” videos on how to add an app on your phone. E-Commerce Opportunities Through a joint partnership with China-based online retailer Alibaba.com, TEB Bank pays for a banner advertisement on the Alibaba website and SME clients pay TEB to advertise their business in the sidebar. This platform gives clients access to the largest global online retail marketplace. TEB SME Consultants –TEB Bank SME relationship managers can complete a two-year training program and then offer management consultancy services to SME clients in areas such as marketing, long-term strategy and human resources. SME Academy – TEB SME Academy aims to increase the competitive power of SMEs through interactive workshops and trainings. Workshops have been attended by more than 20,000 businessmen and women to date. While these workshops increase the managerial and technical capacity of the SMEs, they also create customer loyalty to TEB and reduce risk as entrepreneurs become better at running their business. Future Strategy Conferences – These TEB-organized events bring together prominent figures in major sectors (such as automotive, jewelry, tourism and agriculture) to map out a strategy for the sector’s future. These conferences are an integrated approach to development but also strengthen TEB’s networks and position them as market experts in these areas. Start-Up House – Start-Up House offers business management consultancy support for startup businesses. Start-Up House has 16 branches, mostly at universities across Turkey and plans to open an office in Silicon Valley early next year. The Start-Up House headquarters offers free desk space to TEB entrepreneurs as well as access to business advisory services. It offers trainings to entrepreneurs in everything from digital marketing, contracts and agreements to intellectual property. TEB also connects their clients to angel investment opportunities. Seeing the breadth of non-financial services offered inspired the visiting NBS Bank leaders: “When you come on a program like this, you can see things that completely change your perspective.” While the market and needs are different in every country, the visit to TEB Bank showed them the importance of capacity building for SMEs and the benefits of investing in a deliberate training program. One senior leader of NBS Bank said “Sometimes we need to be risk takers. These people have been successful because they have put resources behind their SME business.” Based on what we saw in Istanbul, it is definitely paying off, both for TEB and for the SME entrepreneurs they support.